Leave it to a company that makes handbags and diaper bags to make a laptop bag that’s practical, comfortable, and attractive. I carried JuJuBe’s $200 Giga Be Earth messenger-style laptop bag around for a week, carting it to work and home again on my bike and on public transportation. Not only did it fit all of my daily essentials, it was easy to carry and relatively compact—even when stuffed with a laptop, a wind breaker, and enough toiletries and makeup to stock the shelves of a tiny Walgreens. 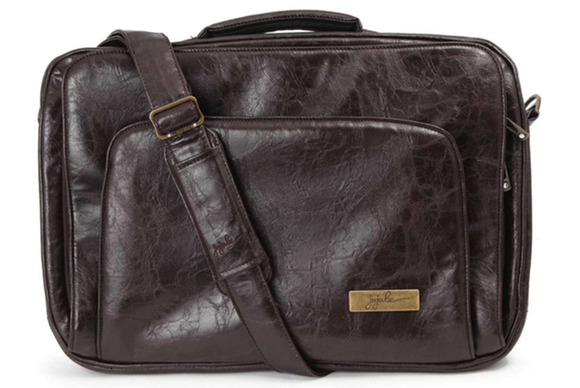 The Giga Be Earth fits 17-inch and smaller laptops and is made of a soft, faux leather. (I tested the black version; it’s also available in brown.) The laptop rests in a large, spacious, main compartment that also hosts three small sleeves, each big enough for a mouse, an external hard drive, or some cables. A spacious front pocket has a hidden zipper for a wallet, as well as spots for personal items such as a phone, iPod, and pens. On the back of a bag, a slip-in pouch can hold a few folders or magazines. The Giga Be Earth also comes with a drawstring pouch big enough for a laptop charger, and an elastic strap with a clip for your keys. The corners of the Giga Be Earth are reinforced with an extra layer of foam to absorb shock, and the interior of the bag is lined with what Ju-Ju-Be calls BeCool Venting Technology—the company’s fancy name for perforated foam to keep your laptop cool. The Giga Be Earth weighs two pounds when empty and can be carried with either its quick-grab handle or its adjustable shoulder strap. The shoulder strap sports a memory-foam pad that makes the bag comfortable to carry when loaded up. Even after a seven-mile long bike ride, the strap didn’t cut uncomfortably into my shoulder. The only thing missing from the Giga Be Earth is a designated sleeve to secure your laptop inside the bag. The large, zippered main pocket is padded, but your laptop sits loosely inside it. When you unzip the compartment completely, it’s open on three sides (left, right, and top), with nothing to hold your laptop in place. (The exception is if you have a 15-inch or 17-inch laptop—larger laptops are sort of held in place by the top lip of the compartment. My 13-inch MacBook Air, on the other hand, could easily slip out.) A dedicated internal sleeve, or even an elastic strap, would be a nice addition to keep your laptop in place. Perhaps the best part about the Giga Be Earth is its Earth Leather exterior. Unlike many faux leathers, the Earth Leather doesn’t look or feel plasticky, and it’s soft while still being durable. The material is stain resistant, but if you happen to spill something on it, the entire bag is machine washable. The Giga Be Earth is a great option for a woman who needs a comfortable, practical bag and wants simple style with some subtle flair.